No dividend yield can be high enough to justify an investment in a business with deteriorating fundamentals. Investing in companies with above-average dividend yields can be an effective strategy to rake in superior returns. However, not every company with a tempting yield is a smart purchase. Far from it, in fact: Investing in businesses with deteriorating fundamentals can be an enormously expensive mistake, no matter how good the dividend looks today. Below, three of our contributors describe some high-yield dividend stocks they think our readers should stay away from. Andres Cardenal: Seagate Technology (NASDAQ:STX) is currently paying a huge dividend yield of 8.7%, which is unquestionably tempting at a time when the average dividend-paying company in the S&P 500 index has a yield of 2.4%. On the other hand, Seagate is facing major challenges in the years ahead, and its financial performance leaves much to be desired. The company is a market leader in hard disk drives, an industry experiencing enormous uncertainty due to technological changes and evolving consumer demand in the computing business. 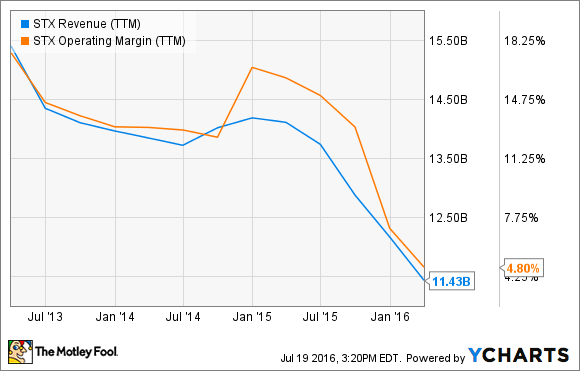 In this challenging environment, Seagate's revenue and profit margins have been shrinking since 2013. For the quarter that ended on April 1, Seagate Technology reported $2.6 billion in sales, a decline of 21% from the same quarter last year. Making things worse, gross profit margin declined from 28.7% of revenue to 20.2%, putting additional pressure on earnings and cash flow. Wall Street analysts are on average estimating that Seagate will earn $2.05 per share during this fiscal year. At current levels, its annual dividend amounts to $2.52, meaning the company is set to pay dividends well in excess of earnings. This doesn't mean that Seagate will necessarily need to cut its dividend in the short term, but the company will certainly need to improve sales and earnings if it's going to sustain that payment level in the coming years. Tyler Crowe: There is a reason that high yield and growth don't often come together in one investment. They are pretty much diametrically opposed, because both growth and dividends take cash from the operation of the business. A company can either pay a modest yield and grow at a decent pace, or it can pay a high yield because it doesn't have a whole lot of avenues for growth. Golar LNG Partners (NASDAQ:GMLP)is trying to do both at the same time, but its chances of pulling that off are pretty slim. Golar LNG Partners and its parent company, Golar LNG (NASDAQ:GLNG) are looking to serve a unique niche in the liquefied natural gas industry. They are building out a fleet of floating LNG facilities that can both produce LNG and regasify it at the point of delivery. These are unique assets that could be very useful in developing natural gas reservoirs in places where it's too costly to build fixed facilities or where infrastructure is really limited. The issue with this plan, though, is that it will require a lot of capital to make it happen, so it's in the company's best interest to preserve cash flow to build these assets rather than pay its generous dividend, which now yields 11%. Eventually, the conflict between these two cash drains will come to a head, and chances are, the dividend will be the one that gets the cut first. That will be a smart move for the company to make to advance its long-term prospects, but it doesn't make for the most appealing investment today. George Budwell: PDL BioPharma (NASDAQ:PDLI) may offer a juicy dividend yield of nearly 6% at current levels, but income-seeking investors simply shouldn't risk it. In a nutshell, PDL's total annual revenues are forecast to plummet by 63% this year, and another 28% next year due to the loss of royalties from its so-called "Queen patent portfolio." Unlike typical pharmaceutical companies that sell drugs to generate revenue, PDL relies on royalty payments from licensing agreements with other companies. Unfortunately, the company's largest source of royalty revenue -- the Queen patents -- expired in December 2014, and Roche's Genentech made its last remaining payment under its legal settlement with PDL for the drugs Avastin, Herceptin, Xolair, Kadcyla and Perjeta in the first quarter of 2016. These key drugs make up 86% of PDL's royalty revenue from the Queen patents, meaning that the company's top line is on track to drop by a massive 75% for the second quarter of 2016, compared to the same period a year ago. To be fair, PDL has been aggressively pursing deals with other biopharmas in an attempt to soften the blow from the loss of its most important revenue source. However, the fact remains that PDL is ripe for a hefty dividend reduction in the near future.